I LEFT MY CAMERA AT HOME. Then I spotted a bald eagle scavenging in an open field. Shot missed. A few miles later, after reaching our destination, St. Patrick’s Church in Shieldsville, I realized for the second time that I should have hauled my Canon DSLR with me. But my husband and I were attending a theatrical production. And, as live theatre goes, photography is typically not allowed. Plus, lighting is often insufficient. Still, I could have gotten some shots afterward of the seven young performers from Child’s Play Theatre Company who presented an impressionable drama on a portable stage in the fairly well lit St. Patrick’s Fellowship Hall. This cast photo from “I Never Saw Another Butterfly” is courtesy of Child’s Play Theatre and was taken by Chris Vilt. Cast members, left to right, are Dylan Vilt, Ian Hanson, Aimee Ilkka, Amber Simon, Olivia Simon, Carolyn Mikel and Lucia Rynda. Upon arrival, I had no idea what to expect. I knew only that we would be seeing Child’s Play Theatre’s production of I Never Saw Another Butterfly, an introspective drama about Jewish children temporarily imprisoned in Terezin. Most of the 15,000 children held there eventually were shipped to Auschwitz and thus to a certain death in the gas chambers. Heavy stuff. 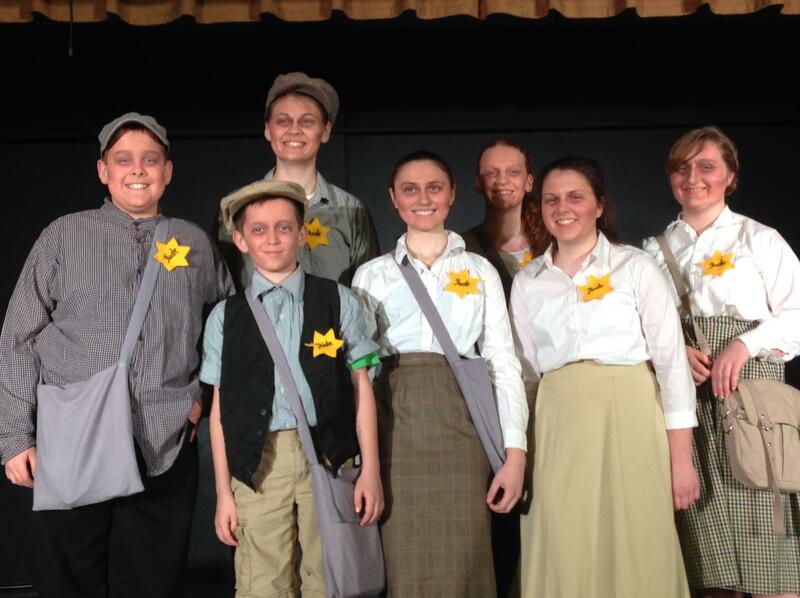 I thought an adult theatre troupe would perform the drama, even given the name “Child’s Play.” I wasn’t expecting seven Montgomery-Lonsdale-New Prague area performers ages 11 – 14 to take the stage. But they did. And the performance these youth delivered was deserving of the standing ovation we gave them. 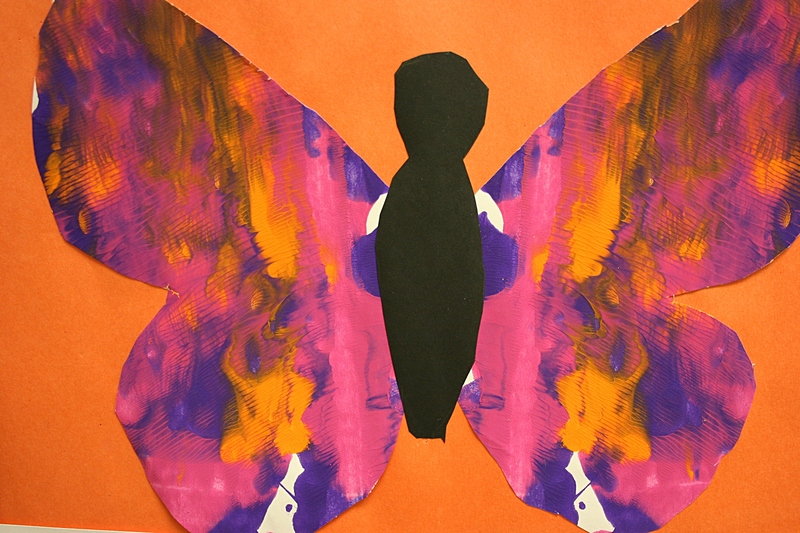 First grader Kyle Ernste of Nerstrand Elementary School painted this butterfly, displayed at the Paradise Center for the Arts, Faribault, 2012 Student Art Exhibit. Image used here for illustration purposes only and does not reflect art produced by Child’s Play Theatre participants. Minnesota Prairie Roots file photo 2012. Director Andrew (Andy) Velishek wasn’t exaggerating when he suggested, in his introductory remarks, to have a tissue handy. The depth to which these five actresses and two actors played their roles was haunting and memorable. I felt their fear, heard their anger and desperation, experienced their joy in imagining flowers and butterflies. As a poet, I connected with the poetry they read. In Terezin, children’s art and writings were buried and later uncovered. Art mattered in Terezin. Just like it matters to Velishek, whom I talked with prior to the play. He is passionate about theatre. He’s been involved in more than 80 productions with 25-plus years of acting and 15 years of directing/producing experience. And he’s passionate about helping children, especially, to use their imaginations and to learn and hone the craft of performing. This stay-at-home dad and sometimes substitute teacher has three boys ages nine months to five, the oldest ones already showing an interest in performing. 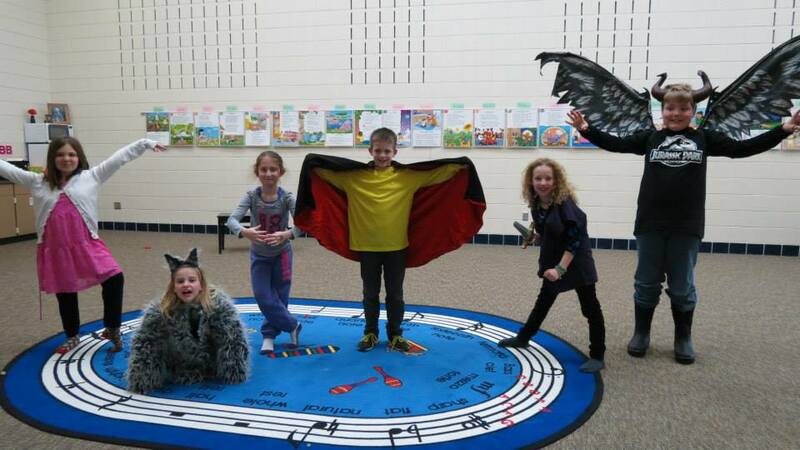 Child’s Play Theatre presented an Improvisation Theatre Workshop through Shakopee Community Education in 2013. That resulted in a 15-minute skit that included vampires, angels, bullies, a wolf and a dragon. Photo by and courtesy of Andy Velishek, Child’s Play Theatre. Velishek travels from his Montgomery home base to southern Minnesota schools, community centers, libraries and more with his educational theatre company that draws youth on stage. Past productions include plays such as Beauty Is A Beast, The Best Christmas Pageant Ever and Twinderella. He formed the theatre company in 2012 and, he says, is laying the foundation to keep community theatre alive. His focus is on the kids. You won’t find a professional performer in the lead role with youth as just supporting cast, he says. If there are not enough parts in a script for kids, Velishek will write in roles. You can hear the energy and passion in his voice, see it on-stage in the performances of those he directs. Butterfly even started a bit late because this director was so engaged in telling me about Child’s Play Theatre. Now that’s a man who loves what he does. He teaches and encourages and celebrates success, noting to the audience that the cast of I Never Saw Another Butterfly was honored for Outstanding Achievement in Acting-Ensemble at the recent Minnesota Association of Community Theatres’ MACT Fest 2015. When I the congratulated the cast of Butterfly for their performance at St. Patrick’s, their enthusiasm for theatre ran strong. Velishek is encouraging their creativity, building their confidence, teaching them that performing is a gift they can give back to their communities. They’ve seen the butterflies and the flowers. 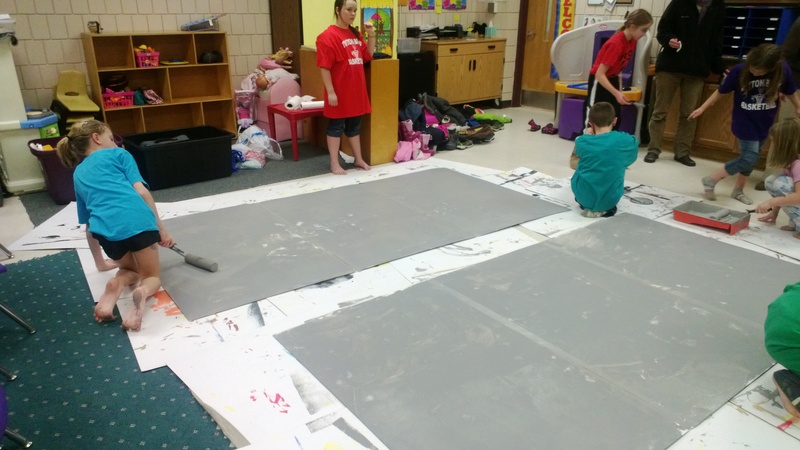 Child’s Play Theatre includes creating and building the set. Photo by and courtesy of Andy Velishek, Child’s Play Theatre. FYI: Here’s a sampling of upcoming Child’s Play Theatre camps/shows: Twinderella, 2 p.m. and 7 p.m. May 16 at Twin Oaks Middle School (Prior Lake-Savage Schools); Disney’s The AristoCats Kids, 7 p.m. June 5 and 1 p.m. June 6, Tri-City United Schools in the Montgomery Middle School Auditorium; and Twinderella, 6 p.m. June 12, Owatonna Senior High School. 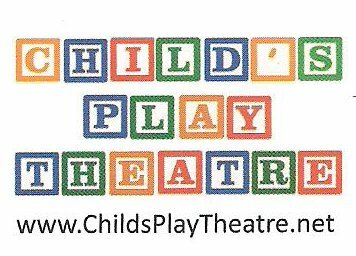 For a full schedule, visit Child’s Play Theatre website by clicking here. All productions include week-long camps for kids K-12 with registration done through local Community Education departments. Show tickets are available at the door and are kept at a family friendly cost, Velishek says. Velishek also offers theatrical opportunities to adults through Limelight Theatre Company, a division of Child’s Play Theatre. Limelight debuted at Next Chapter Winery south of New Prague last September with a dinner theatre production of The Complete Works of William Shakespeare Abridged. Child’s Play Theatre photos are copyright of Chris Vilt and Andy Velishek. FOR CHRISTIANS LIKE MYSELF, Holy Week marks a period of reflection and repentance as we remember the final days in the life of Christ before his crucifixion and resurrection. 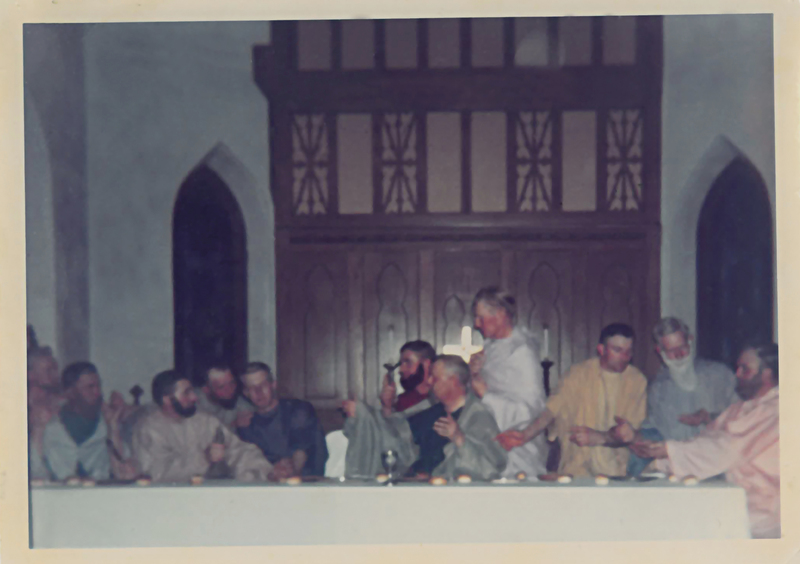 St. John’s members portray the disciples in this undated vintage photo, the first record of a photograph from “The Last Supper Drama.” Actors, from left to right, are Luverne Hafemeyere, Earl Meese, Vicgtor Luedke, Howard Meese, Virgil Bosshart, Arnold Keller, P.L. Golden, Alvin bosshart, Paul Bauer, Elmer Covert Sr. and Arnold Bauer. Photo courtesy of St. John’s. 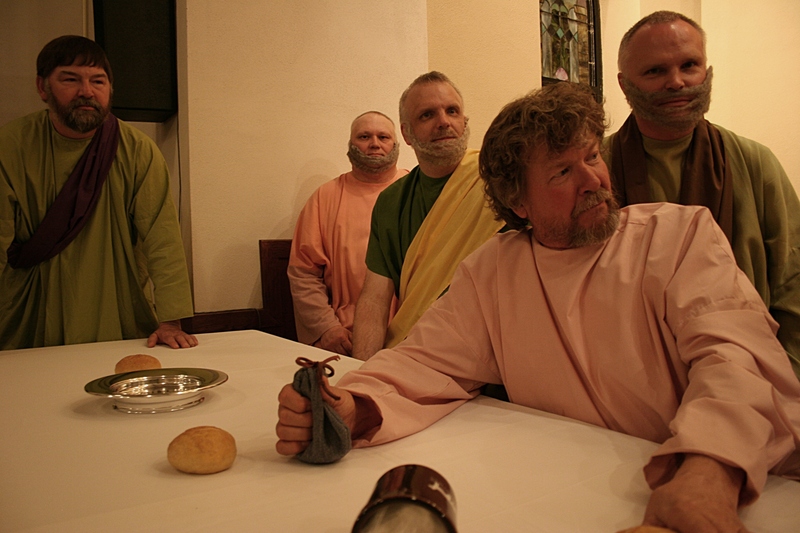 For St. John’s United Church of Christ, Wheeling Township, rural Faribault, a presentation of “The Last Supper Drama” has been a long-standing Holy Week tradition. 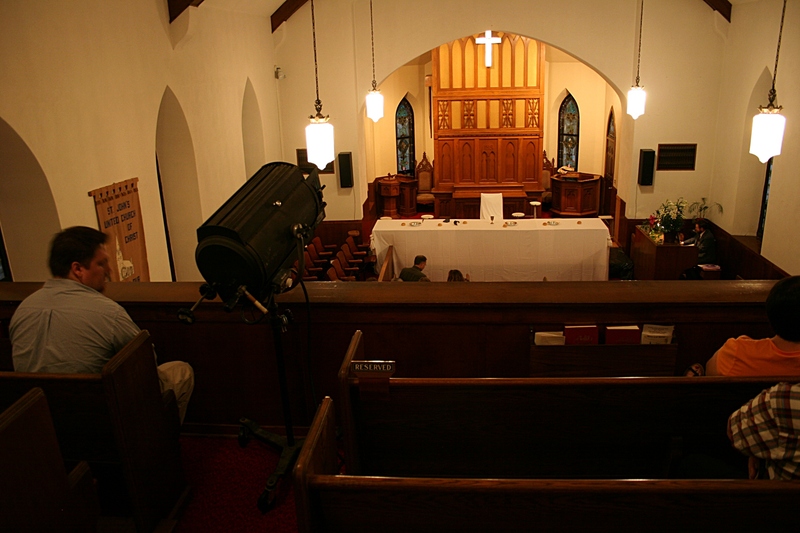 For 51 years, 52 this April 13, this congregation has presented the drama written by long ago pastor, the Rev. W. Rasche, and based on Leonardo da Vinci’s famous painting. It’s truly remarkable that a tradition like this would continue for more than five decades. Twice, if not thrice, I’ve lost count, I’ve attended this Palm Sunday evening drama at this country church northeast of Faribault. St. John’s 50th presentation of “The Last Supper Drama” in the sanctuary. Minnesota Prairie Roots file photo 2012. As darkness falls, voices hush, mood-setting music plays and a spotlight shines upon 12 performers role-playing the disciples. It is a profound performance which presents a personal perspective on the relationships between Jesus and his followers. I’d encourage you to attend. It’s worth the drive, worth your time. There’s something about sitting straight-backed in a pew in the darkness of a Palm Sunday evening within the walls of an aged limestone church in the company of believers that comforts me and puts me in the proper meditative mindset for Holy Week. And that reaction is, I expect, exactly as St. John’s intends. The parking lot at St. John’s United Church of Christ, Wheeling Township, is nearly full 20 minutes before the congregation’s annual performance of “The Last Supper Drama”. Minnesota Prairie Roots file photo 2012. FYI: St. John’s is located 10 miles northeast of Faribault. Take Minnesota State Highway 60 east for eight miles and then turn north onto Rice County 24. Drive two miles to 19086 Jacobs Avenue. The drama begins at 8 p.m. on Sunday, April 13, and is followed by lunch afterward in the fellowship hall. THOUSANDS OF MILES from Milan, Italy, in the flat farm fields of Rice County in southeastern Minnesota, Leonardo da Vinci has left his mark on a small congregation. 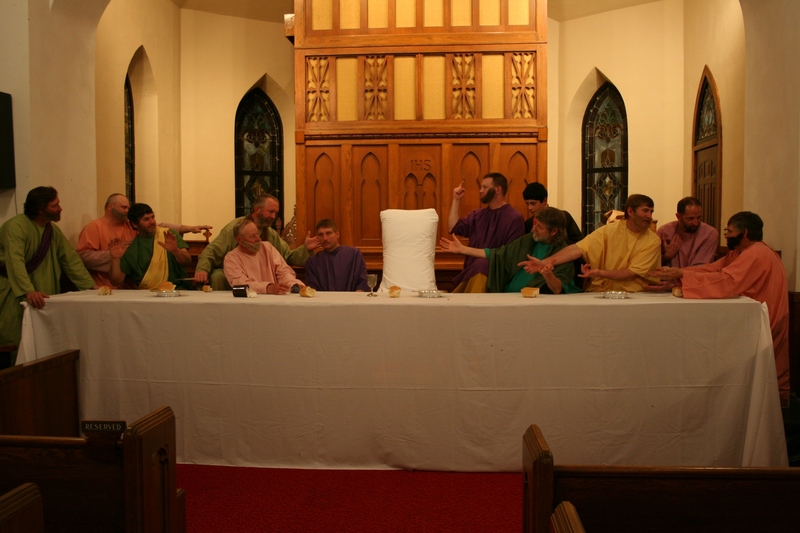 For 50 consecutive years, St. John’s United Church of Christ, Wheeling Township, has presented The Last Supper Drama, a theatrical interpretation of the master artist’s most famous painting created in 1495 as a mural in an Italian monastery. St. John’s 50th presentation of The Last Supper Drama in 2012. I penned those two opening blog post paragraphs during Holy Week 2012, shortly after attending the St. John’s performance. So update that number. 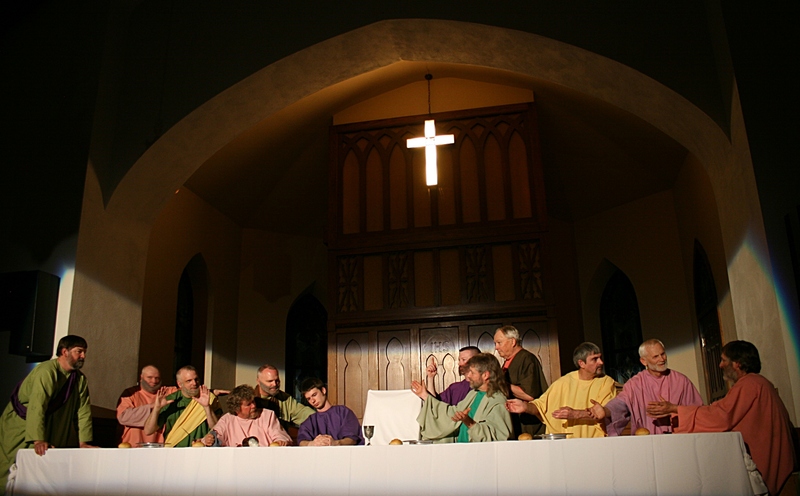 The congregation is slated to present its 51st The Last Supper Drama at 8 p.m. on March 24, Palm Sunday. I’d advise attending because you don’t get more grassroots basic than this in the retelling of Christ’s final meal with his 12 disciples via a script penned by a long ago St. John’s pastor. Judas grips the bag of silver, his reward for betraying Christ, as seen in the 2012 drama. Each disciple speaks of his personal relationship to Christ, making this a particularly introspective drama presented by members and former members of St. John’s. The parking lot at St. John’s United Church of Christ, Wheeling Township, is nearly full 20 minutes before the congregation’s annual performance of The Last Supper Drama. Truly, there’s something about slipping inside this rural 1800s limestone church as evening melds into night, settling upon aged pews among those who have worshiped here for generations, that is particularly comforting. It is good for the soul to sing and pray and listen, to sweep your thoughts into a meditative mindset for Holy Week. That this country congregation continues with a tradition begun in 1963 impresses me. Such uninterrupted longevity is a testament to faith, an appreciation of history and a clear understanding that still today, perhaps more than ever, The Last Supper Drama needs to be shared. A view from the balcony before the drama begins shows the spotlight to the left and The Last Supper table below. The actors enter, spotlighted in the dark church, to take their seats at the table. There they “freeze” in place to mimic Leonardo da Vinci’s painting. 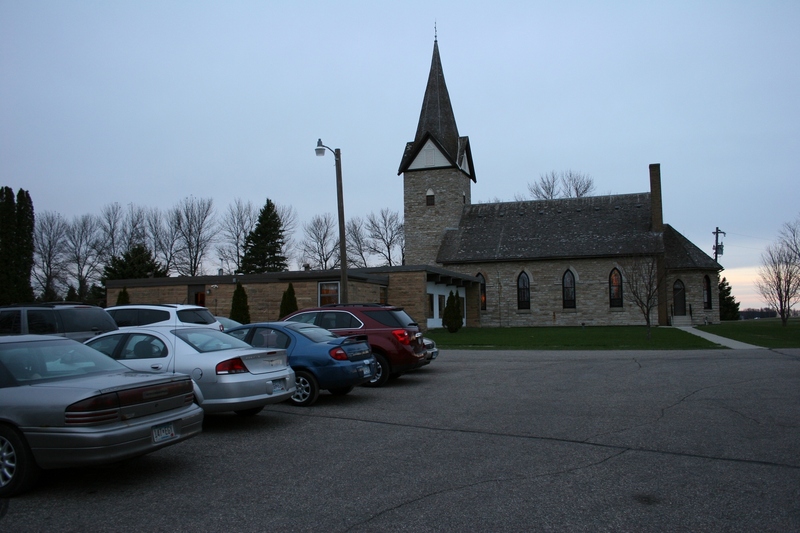 FYI: St. John’s United Church of Christ, Wheeling Township, is located 10 miles northeast of Faribault. Take Minnesota State Highway 60 east for eight miles and then turn north onto Rice County 24. Drive two miles to 19086 Jacobs Avenue. Click here and then here to read my detailed The Last Supper Supper Drama posts from 2012. Click here to read my post from 2011. “WE NEED TO GET the car out of the garage!” I yell, throwing open the passenger side door as I observe smoke seeping from under the hood. “Do we need to call the fire department? “I don’t know. Get out and push,” my husband orders after he has turned off the car and then turned the ignition switch back on and then off, realizing his mistake. And like that I rocket out the door, lock gloved hands onto the hood and push with all my might to get our 1995 Chrysler Concorde out of our attached garage. Gas fumes hang heavy in the air. In that adrenalin-charged moment, a visual image of the car bursting into flames, igniting the garage and then catching our house afire flashes before my eyes. I am scared, but not astute enough to realize that I could be placing myself in danger by staying with the car. Randy isn’t listening, mostly because he knows the car isn’t going to explode now. The danger has passed. He lifts the hood. The “smoke” I’d seen wasn’t smoke at all, but vapors from gas hitting a hot engine. However, I knew the danger had been real and a fire could have erupted. That Randy does not deny. The Chrysler Concorde, photographed several hours after we pushed it from the garage. My automotive machinist husband diagnoses the problem as a leaky fuel line or valve. 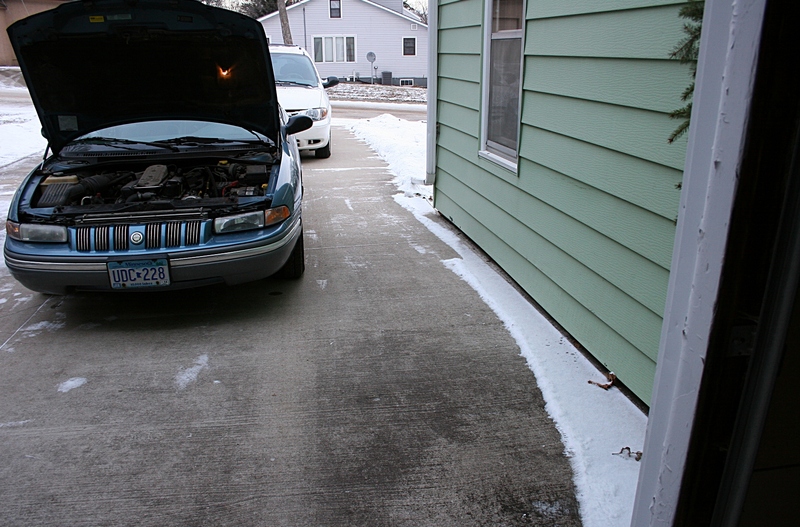 A stream of gas drips up the driveway, ending in a puddle at the front of the garage. It is less than a cup, probably, but spilled across the flat concrete floor appears to be more. The car has dripped fuel all the way from the grocery store several miles away where the problem began. It was there that I first sniffed gas and Randy dismissed the odor as coming from another vehicle. He lifted the hood then, claimed not to smell anything unusual. I claimed otherwise. Perhaps his answer was a white lie designed to reassure me. When we finished grocery shopping and returned to our car, the stench of gas still permeated the interior, intensifying when the engine fired up. We rolled down windows, expecting the gas odor to dissipate. The smell only worsened as we headed toward home. I could taste gasoline. I felt a bit off-kilter, as if the fumes were getting to me. When we finally turned into the driveway, I relaxed. But then, once inside the garage, I noticed “smoke” rising from beneath the hood and my instincts kicked in. Get the car. Out of the garage. Now. NOTE: If my husband was to share this story, he’d likely present a less dramatic version with no fear or threat of fire involved. The car has now been repaired, the problem being a disconnected fuel line. The line was apparently not properly latched into place the last time Randy worked on the vehicle.